What Causes Tooth Loss and How Can Dental Implants in Temple Help? Did you know that there are an estimated 40 million Americans who have lost all their teeth and 178 million who have lost at least one? Although the rates of tooth loss have decreased since the 1970’s, there are still many people still dealing with the side effects of tooth loss, like less self-confidence, giving up favorite foods and not smiling or laughing as much. These issues have a serious effect on a person’s overall quality of life, but there are great restorative options such as dental implants in Temple that can give them back the look and function of their smile. Keep reading to learn more about dental implants, as well as what causes tooth loss in the first place and how can it be prevented! If you’ve lost all the teeth on the top or bottom arch and wear traditional dentures, you can benefit greatly from the many advantages an implant-retained denture offers. If you’ve only lost one tooth or several teeth, there are still some things you can do to hang on to your remaining teeth as long as possible! When it comes to preventing tooth loss, the name of the game is prevention. Good oral hygiene habits are the foundation of a healthy smile because they prevent both cavities and gum disease, both of which can lead to tooth loss. Be sure to brush at least twice a day for two minutes and floss once. An electric toothbrush will probably do a better job than you can do with a manual and, for some people, flossing after lunch or dinner each day is easier than at bedtime. It’s also crucial to see a dentist in Temple for regular checkups and cleanings so that any problems are diagnosed and treated as early as possible. And don’t hesitate to ask your dentist or hygienist for recommendations of special tools that might help you at home, such as an oral irrigator or an interdental brush. Why Are Dental Implants Such a Great Solution? 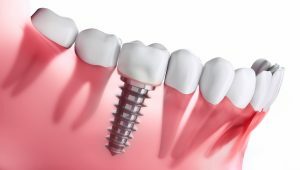 For patients who have already experienced tooth loss, dental implants have become increasingly popular in recent years for one good reason: They look and feel more like your own natural teeth than any other option. Whether you need to replace one tooth, several teeth, or all the teeth in an arch, implants can be used in a variety of ways to create the perfect solution for your needs. Implants are such an outstanding way to address tooth loss that most people’s only regret is that they didn’t get them sooner! Dr. Richard Fossum is a general, cosmetic and restorative dentist who understands how much his patients’ lives are affected by tooth loss. That’s why he’s thrilled to offer a solution like dental implants that will restore their smile, self-confidence and overall quality of life. If you’ve experienced tooth loss and have any other questions, he can be reached via his website or at (254) 778-3900. Comments Off on What Causes Tooth Loss and How Can Dental Implants in Temple Help?